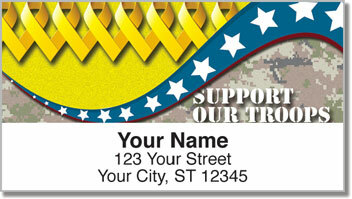 How often do you think about the men and women serving our country overseas? Is it only when you hear them mentioned on the evening news? Do you only pause to remember the military on Memorial Day and Veteran's Day? 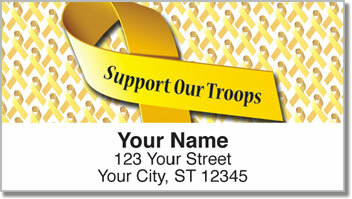 The familiar yellow ribbon is a symbol that helps us keep our troops in our thoughts and prayers. Now every time you prepare outgoing mail, you'll be reminded of their bravery, their services and the many sacrifices they've made. Everyone on your mailing list will be reminded too. 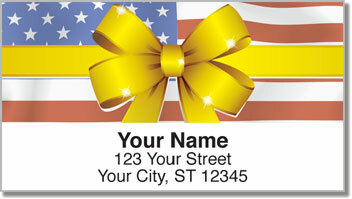 These patriotic address labels feature a self-adhesive backing. That means you no longer have to write out your return address by hand. It's a convenient solution to an often tedious task. 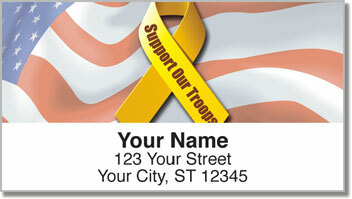 Get your very own Support Our Troops Address Labels from CheckAdvantage today! Matching checks are also available.